It's been revealed today that NVIDIA have dropped the retail price of their 700-series GPUs, and not in minor increments as one might otherwise expect. With meaty nibbles taken out of the GTX 750Ti and huge chunks from the GTX 780Ti the new price/performance range is looking far more logical in the face of the GeForce GTX 970 and 980's release on Friday. At the entry-level gaming end we have the GeForce GTX 750Ti, based on the first iteration of NVIDIA's Maxwell architecture, now at a sub-£100 price point. Originally released at £114.99, the £15 reduction to RRP is chiefly to reference variants, with overclocked versions still available for a little more. Consumers and gamers on a budget should find it capable of excellent 1080p performance for the price. Next up is the Kepler-based GTX 760, now from £146.99. A mid-range performer for 1080p with high image quality settings, the GTX 760 was at one stage seen as a price/performance powerhouse at a little over £200. At less than £150 it will be excellent for gamers looking for a little more quality, and be a tempting pick-up for SLI if you already have one. Also Kepler-based, the GTX 770 is the most up to date form of the GPU seen in the GTX 680, NVIDIA's former flagship of a few years ago. Offering excellent performance at 1080p and 1440p, the card is now available at £179.99 for a 2GB GDDR5 variant, around £20 off the pricing from last week. 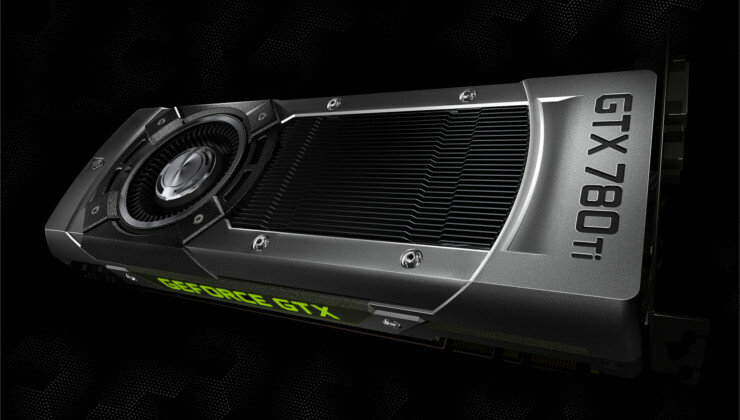 The largest price reductions however are reserved for the GTX 780 and GTX 780Ti. Top-notch performance came at a cost as the GPUs came in at £300 and £500 or more respectively, but on NVIDIA's side were the only ones capable of 1440p at highest image quality and 4K gaming (even if at times they needed SLI). Now they've had as much as £200 lopped off, hitting only £370 for the GTX 780Ti and as little as £229 for the GTX 780. Partner variants with aftermarket coolers and factory overclocks have also had corresponding reductions, although certain special editions retain a considerable premium over the standard. The update should now be reflected in pricing at some UK etailers. It's not clear if AMD are in a position to reduce pricing to keep pace with this update. As things stand, if you were looking for an NVIDIA-powered system, upgrade, second card for SLI or just a little more wriggle-room in your budget for an SSD or better monitor, now seems like a good time to buy.